Use these buttons to move the currently selected item up or down in the list. Press this button to create a new command to be added to the Favorites list. The new command is inserted directly above the currently selected item. You can modify the properties of the newly created item with the Create Favorite Item window. Press this button to modify the properties of the currently selected item. 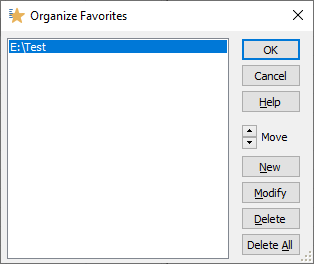 This command will open the Modify Favorite Item window for the selected item. Press this button to delete the currently selected item. Press this button to delete all items from the current Favorites list.